Are you responsible for planning a workplace? Or are you and your company facing an upcoming change of location? Then you've come to the right place. Planning and designing a workplace is something of an art form. While there is no catch-all technique and some customization is required to suit your business and employees, there are some elements you should make sure not to overlook. To help ensure that your workplace is as inspiring as possible and that nothing falls through the cracks (both literally and figuratively speaking), we have put together this guide about how to create the ultimate workplace. It can be highly variable how much control you have over the space itself, and whether you can influence your workspace to a greater or lesser extent. In some cases, you will have very little control over the workspace, and your starting point will be determined for you. But in other cases, the office area may be significantly based upon your input. In determining the details of your workspace, it is essential to know for whom exactly you are planning your office. Why, might you ask? Well, any office or workplace should be in line with the business that is going to work within it. The space should be conducive to the overall goals that the business strives for, amenable to the needs of the business and, above all, accommodating to the activities that will be carried out there. Recently, open office landscapes and freer office arrangements have become increasingly popular, and these environments have often been supported by positive results. Most of us work in information-rich companies where collaborations and meetings have become a steadily more important part of the work day. Any office space needs to be able to meet these needs. Create a list of activities that are accomplished in the workplace – what tasks do employees do daily? Think about what features and types of spaces might be helpful, and which would be unnecessary. If, for example, your work is entirely digital, you may not need larger spaces for printers or paper storage. Instead, you would want areas where people can hold meetings or calls without being disturbed, such as a telephone booth or a small meeting room. Does your workplace call for a great deal of coordination and communal activity? Then make sure there are common areas; these so-called "break-outs" are important for people to sit down together and discuss. Get meeting rooms! — But, as always, make sure you know who it is, exactly, that you are planning for. Ask those who are going to move into the workplace, or your colleagues, about how many meetings they have, and how many people are usually in attendance. Any meeting room should be planned around these crucial details. If, for instance, you are using a room booking system, it is very useful to use room usage statistics in your planning. According to our collected data, the most common meetings have between 1-4 participants. Which may mean, for example, that you should ensure that there are more smaller meeting rooms available, rather than sacrificing these in service of a larger room. When it comes to lighting, there are a few key details to keep in mind. Good lighting is essential for creating a positive work environment, and it has been proven that poor light can adversely affect people’s work. There is also a strong connection between lighting and ergonomics; when it is difficult to see, we tend to squint our eyes and bend forward, a position that puts a strain on our posture. Lighting should be clear but not glaring. Spotlights, for example, can be used strategically as ceiling lamps. It is important to ensure that every work area in the workspace has access to good lighting. This could, for example, mean installing desk lights. It may be difficult to appease everyone, especially if it's a large office. However, individualized access for each individual to control their own lighting gives everyone a good degree of freedom and comfort, which is usually greatly appreciated. Adjust the light for the purposes of the area it is in. A desk and a resting spot would call for different sorts of lighting. The lighting should reflect the difference in nature. Rest areas should have duller, softer lighting, for example. 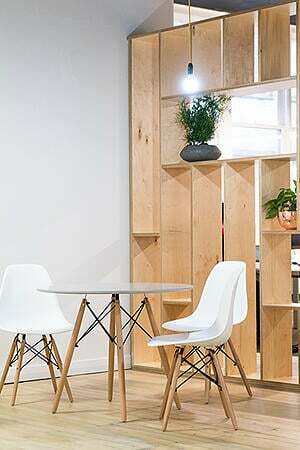 If your workspace allows for daylight as your primary source of light, definitely incorporate it. Daylight is always the best light. Interior design is very important when creating an inspiring work environment. Despite many people’s best efforts, there are many workplaces that fail in this category. We really cannot stress this enough — everything about how you design a workspace depends on the business that will reside within it. The decor, like everything else in the design, should reflect the company that works there, and should represent their office culture. One design element that we often suggest is incorporating plants into the decor, as they can positively affect both mood and work effort. Plants promote creativity for the people in the workspace, and actually clean the air at the same time. Ask the employees if they have any plant preferences — just make sure they are easy to care for! One nice addition that is often appreciated is to allow employees to bring their own personal possessions to decorate their workspace. This personalization means employees can create a more receptive environment where they can feel more comfortable. Make sure to think of any guests the business might have on the premises. If you work at a company that receives many visitors, your choice of decor should take that into account. Don't underestimate the power of first impressions. In modern business, the integration of technology is essential for creating a positive workplace. Technology facilitates a lot of workplace activity. The most important consideration here is to use technology as a way to improve the workplace. Be careful not to make your tech too complicated and approach the project from the wrong direction. The technology you include should adapt to your needs, not the other way around. There are several reasons why technology is essential for building the ultimate modern workplace. One of them is mobility. With the right tech, you do not need to be bound to your desktop. For example, using laptops and cloud services means that your employees need not be constrained to the same location at all times. Technology also enables greater cooperation. There are a variety of technical tools that facilitate and strengthen meetings and other forms of collaboration. For example, you can install tech that allows for remote meetings, or that utilizes screens during assemblies to better illustrate talking points. A conscious use of technology is also good for the environment of the workplace. Using smart ventilation and digital signage can help ensure a comfortable work area with beneficial sound and light conditions. Our advice here is similar to the other aspects of workspace planning. Make sure to adapt the technology to the people and business that will actually work in that space. If it's a company that has a lot of remote or online meetings, using the right technology can make a massive difference. By analyzing who's going to work there, you can ensure that the technology works for them and not the other way around. As mentioned earlier, the purpose of the technology is simplification! Building and planning a workplace is a special kind of project. When you make a home, for example, you can feel free to take your time and slowly build it up. A workplace, however, has to be completed on schedule and fixed for a certain period of time. It is always important to remember that there are no universal solutions. Make informed decisions by always consulting those who will use the office. Keeping this in mind, you can more effectively reach for the ultimate workplace. ← The Secret Money Drain: How Much do Your Meetings Cost?